Born in Waipawa, Central Hawkes Bay, New Zealand – 5 May 1948. Educated at St Joseph’s Primary school, Waipukurau; St Joseph’s (now Chanel) College, Masterton; Holy Name Seminary, Christchurch (Philosophy); Holy Cross College, Mosgiel (Theology). Ordained Priest at Waipukurau, New Zealand by Cardinal Reginald Delargey in May 1976. Appointments held as priest of the Archdicoese of Wellignton: St Joseph’s Parish, Upper Hutt 1976 – 1979; Diocese of Rarotonga, Rarotonga 1980 – 1982; Archdiocesan Youth Ministry 1983 – 1987; Cook Islands Māori Community 1983 – 1987; Holy Cross College, Mosgiel 1988 – 1991; Study in Spirituality, Institute of St Anselm, Kent, UK 1991 – 1992; St Anne’s Parish, Newtown 1993 – 1995. Ordained as Auxiliary Bishop for the Wellington Archdiocese and Titular Bishop of Privata 31 May 1995. Appointed Coadjutor Archbishop of Wellington 24 May 2004. Succeeded Cardinal Williams as Archbishop of Wellington 21 March 2005. Elevated to Cardinal at the consistory 14 February 2015. Appointed Cardinal-priest of Sant’Ippolito Church, Rome. Secretary and immediate past-President, New Zealand Catholic Bishops Conference (NZCBC). Moderator of the Tribunal of the Catholic Church in New Zealand. Bishop of the New Zealand Military Ordinariate. Conference representative on the NZCBC Finance Committee and the Catholic Bishops Committee for Ecumenism. Liaison bishop for Holy Cross Seminary. Member of the Congregation for Evangelization of Peoples and the Pontifical Council for Promoting Christian Unity. When appointed Auxiliary Bishop in 1995, Archbishop John chose as his motto “Peace through Integrity” which is from the prophet Baruch (5:4). 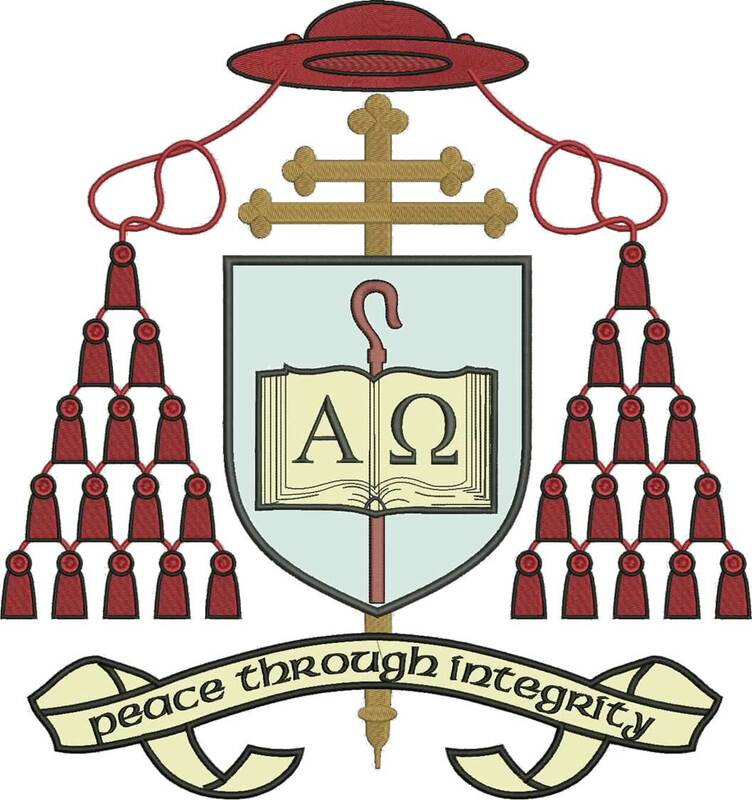 This scripture quote appears on his current Coat of Arms with the traditional colours and symbols of a Cardinal, the Metropolitian Cross, a shepherd’s staff (pastoral staff) and the symbols for ALPHA and OMEGA imposed over an open book of the scriptures.